Croft Farm & Celtic Cottages01239 615 179work Self-cateringYou are warmly welcome to our delightful smallholding in the glorious North Pembrokeshire countryside where we have enjoyed living for the last 30 years. Come and share in the delights of the beautiful countryside, fresh air and fabulous unspoilt beaches and bays that are Cardigan Bay and the Pembrokeshire National Park. 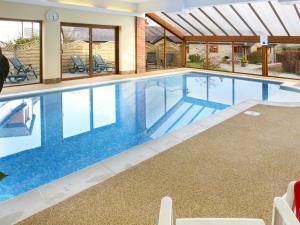 Your holiday at Croft Farm includes use of the lovely indoor heated swimming pool, gym and sauna. We have converted the cottages from traditional stone and slate farm buildings, carefully retaining their character and charm. Each is tastefully furnished. They are Grade 5 & Grade 4 Star. Standard features include central heating, fully fitted kitchen with fridge/freezer, dishwasher and microwave; also DVD player, Freeview, hi-fi and wi-fi internet access. Some of the properties have a wood burning stove and a rustic finish to the walls. We take pride in very high standards and therefore make sure that the cottages are extremely well cleaned and maintained for your peace of mind. Enjoy a therapeutic massage or beauty treatment in the privacy of your cottage. We love the diversity and wealth of colour in creation all around us, so we keep beautiful, well cared-for gardens. A table and BBQ are provided for each cottage so that you can relax and unwind. Exclusive one-to-one swimming lessons with Swimming Without Stress using the Alexander Technique may be prebooked during the quieter months. There is much to offer all age groups: Superb outdoor play area for toddlers to teens, friendly farm animals to feed and cuddle as well as an indoor recreation room. 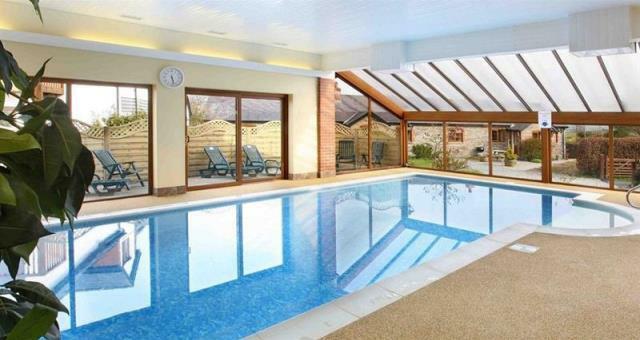 Luxury indoor leisure facilities include the indoor heated swimming pool, sauna, small gym and childs soft play area with toddler toys and a pool table. These facilities are open all year round. You are warmly welcome to our delightful smallholding in the glorious North Pembrokeshire countryside where we have enjoyed living for the last 30 years. Come and share in the delights of the beautiful countryside, fresh air and fabulous unspoilt beaches and bays that are Cardigan Bay and the Pembrokeshire National Park. Shooting, golf, fishing, horse-riding and cycle hire within 5 miles Children welcome from any age. From Cardigan take A487 to 'Fishguard', after 2.5 miles, come to minor crossroads announced by a large green sign on left. Take the first on right to 'Moylgrove', Croft Farm is first on right. Trains are available to Haverfordwest or Carmarthen (as are National Express Coaches). Local bus services go from both Carmarthen or Haverfordwest to Cardigan. The Dairy: Has its own parking bay on a chippings driveway that can extend to 3600mm wide across the adjacent, level slate patio. Level lawn to the front of the cottage. Level path between lawn and cottage exterior of 750mm narrowing to 500mm around the drainpipe. 2 steps into cottage porch with grab rail. One step over the sill into the sitting room. Ground floor rooms: open-plan kitchen, dining area and sitting room with ‘real LPG fire basket in the fireplace. Also on the ground floor are the double bedroom and the bathroom with wc, basin and bath with overhead shower. There is a grab rail in the bath, non-slip mat provided. Floor and wall tiles and suite in contrasting colours. Doorways in this cottage are 800mm. Sufficient natural lighting for property. Supplementary lighting within cottage and available on request. There is restricted access to the upstairs twin bedroom via a staircase with a single banister rail, of 3 stairs to a landing and further 9 stairs up. This bedroom has low, sloping ceilings and raised floor beam. All light switches have 24 hour neon light surround.